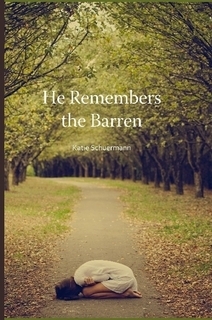 Katie Schuermann’s He Remembers the Barren is a tender treatment of a difficult topic. The topic of barrenness is not one that is much discussed in our culture nor, tragically, in our church. This honest, candid insight into the subject is a much appreciated glimpse into the struggles and questions that surround the subject. In this book, the reader will encounter the anger, helplessness, envy, sorrow, and lament that surround those who live with barrenness. The reader also encounters the pure promises of God in the Gospel and the joy that springs from faith that our heavenly Father truly hears the cries of His children and answers their cries with the forgiveness of sins, the resurrection of the body, and the life everlasting. It is the honesty of these explorations of temporal sorrow and eternal joy, earthly disappointment and heavenly hope that is most striking in this book. Mrs. Schuermann does not attempt to sugarcoat the bitterness of barrenness. She does not exhort those who suffer to paint on an artificial smile and to act as if their sorrow is nothing. Rather, she encourages her readers to lament without falling into self-pity, to be honest with God about their pain, and to look to the promises that He has given in His Son. He Remembers the Barren recognizes barrenness for what it is – an effect of sin rampant in this fallen world – and then looks to the Savior as the answer. In a most refreshing way, He Remembers the Barren never turns the Gospel into mere wish fulfillment. Faith is not made into a means to the end of restoring fertility. Throughout the book, the Gospel remains the proclamation of sins forgiven in the crucifixion of Jesus Christ. It is in this clear confession of the Gospel that the book brings comfort to those who suffer. This proclamation is what gives the book its true theological strength. It redirects the reader not to seek identity in medical diagnoses or categories of personal desire, but rather firmly roots the reader’s identity in their baptismal adoption as a redeemed heir of Christ. He Remembers the Barren holds up the Gospel as the answer to the heartache of barrenness. It answers our suffering with the suffering, death, and resurrection of the Son of God, who grants forgiveness, eternal life, and a family without number in His Church. The simple writing style of the book makes it accessible to both clergy and laity. While it includes open, direct discussions of the ethics that surround barrenness and fertility, it does not weigh itself down with jargon or unnecessary verbosity. In its discussions of these ethical questions, it remains compassionate and points any who may have troubled consciences over past decisions to the forgiveness of Christ. The book maintains a conversational tone throughout, including anecdotes, stories, and examples of how barrenness affects people from all walks of life. Each chapter ends with a reading from Scripture, a collect, and a stanza of a hymn, all of which give material for devotions and meditation. This again draws the reader’s focus solely to the promises made to them in Christ crucified by their heavenly Father. The usefulness of this book extends beyond those who are directly affected by barrenness. Mrs. Schuermann identifies the core cause of the frustration and anger that comes with barrenness as a desire for control. This insight addresses the central problem of being a fallen mortal descendant of Adam and Eve: the desire for control over and against what God has chosen to give. In this way, this book speaks to a wider audience of those who have been disappointed, frustrated, or suffered in any situation. It speaks to those who suffer loss and sorrow over broken plans and hopes. It calls out the desire to control even God and His gifts for the sin that it is. It then extends the Gospel to heal those with seared consciences. As pointed out in its pages, it is often impossible for those who are not suffering from barrenness to know what is in the minds of those who are. Through its candid discussion of the topic, a window into these thoughts is given. This is especially useful for those who have family or friends who suffer under this particular cross. It helps give understanding to those who might want to help “fix” their loved one out of genuine concern without knowing how it affects them. It is also an insight for those who provide pastoral counsel to those who feel the despair and hopelessness that this burden can bring. He Remembers the Barren gives words to the silent struggles and fears that a pastor may not even be aware of when he is providing pastoral care. This makes it a valuable tool for pastors and parishioners alike, who will find in it help with navigating the confusion and difficulty that surrounds this topic. This entry was posted in Latest News and tagged Book review, Katie Schuermann. Bookmark the permalink.